You get — count 'em! — four 8.5 x11 sheets, quality printed with fade-resistant inks and four Premium Downloads at a special price. The Star Rays, Agave, Heureux Noël and Three Angels Miniature Nativities decorate (with other crèches) a Miniature Crèche Tree. You love our Premium Downloads that you can print on your own, but you've also love these quality nativity sheets. 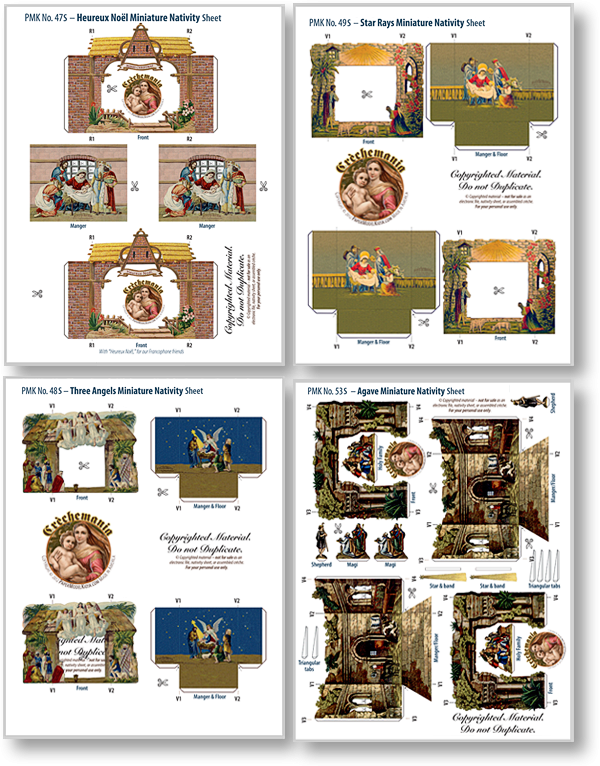 The Crèchemania Miniature Collection 1 Premium Download & Nativity Sheet gives you the best of both worlds. 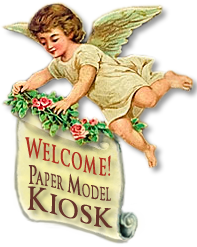 The miniatures you print yourself or create from our nativity sheet are 3.5 inches wide and light as a feather. In fact, if I play a few notes on the grand piano, these miniature nativites start to dance. Not that it takes much to animate these 3.5 inches wide miniatures: hanging on the slender wire branches of my Miniature Crèche Tree (shown at left), and weighing .10 ounces or less, even the slightest vibration of the grand piano sets them in motion. You'd think they're suspended from springs — not strings! And for a special treat, the second Heureux Noël Miniature Nativity has a "Merry Christmas" greeting in French, for our Francophone friends. For a special price, you get four Premium Download for unlimited prints, four 8.5 x 11 ink-jet sheet printed on heavyweight professional paper. And, would you believe, there are two each of the four miniature nativities on each sheet, including one with a "Merry Christmas" greeting in French? Size: 13 x 19 inches.